6:45 to 7:00 Information about Queen St conversion and Locke St. construction available. 8:10 – 8:50 – Scramble in each section to discuss plans offer ideas etc. Give your garden a bag or 2 of the good stuff! 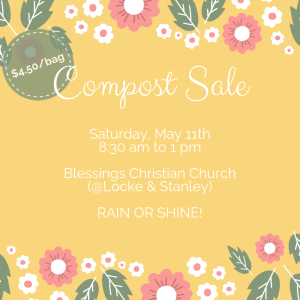 Our annual KNA compost sale will be on Saturday May 11th from 8:30 am to 1 pm at Blessings Christian Church at Stanley Ave. and Locke St.
Compost is from Monaghans Mushroom farm. 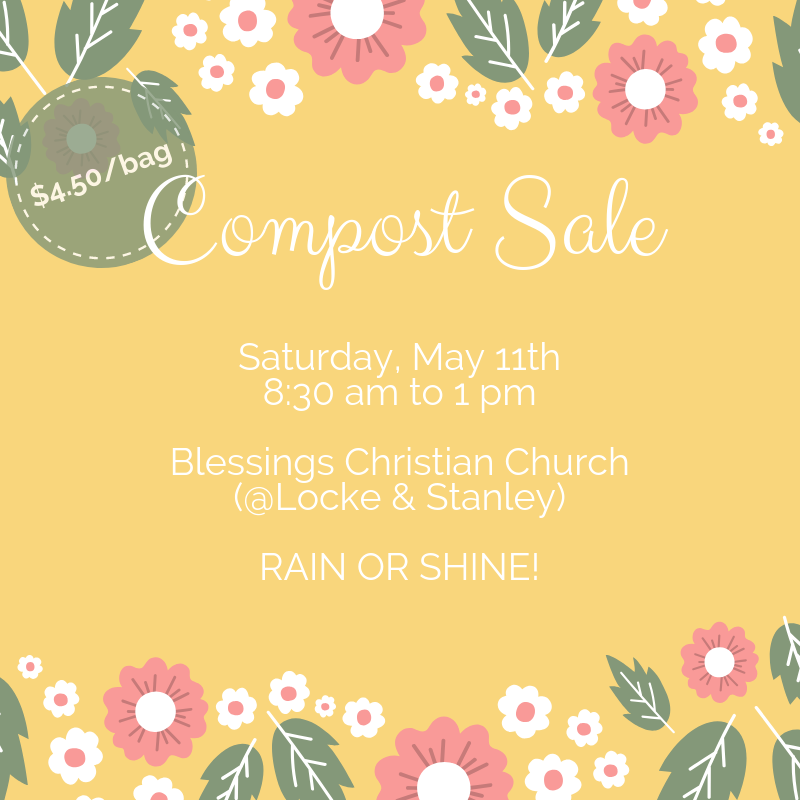 Please email events@kirkendallhood.ca to pre-order your compost. The Kirkendall Garden Club will also be at this year’s sale selling veggie and perennial seedlings. Please make any comments below. 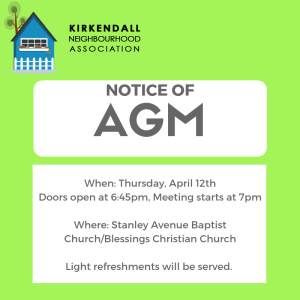 The Kirkendall Neighbourhood Association (KNA) condemns violence, racism, hate and discrimination in all forms. It is the understanding of the KNA that the “patriot” march this Sunday, March 25, on Locke St. will promote divisive values of hate and racism that are not welcome here. Kirkendall is a loving, diverse and inclusive neighbourhood and we denounce this march in the strongest way possible. 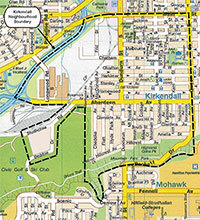 Hamilton-Wentworth District School Board (HWDSB) Board of Trustees are considering a change to the current ward distribution in response to the new ward boundaries approved by the City of Hamilton and we are seeking public feedback on a preferred option for ward couplings as well as feedback on ward couplings for both Alternate Option 1 and Alternate Option 2. If you are interested in providing feedback, please fill out the survey, which will be available until 4 p.m. on March 31, 2018. The Board of Trustees will receive a final recommendation along with a summary of all survey responses received at a Special Board meeting on Monday, April 9, 2018. 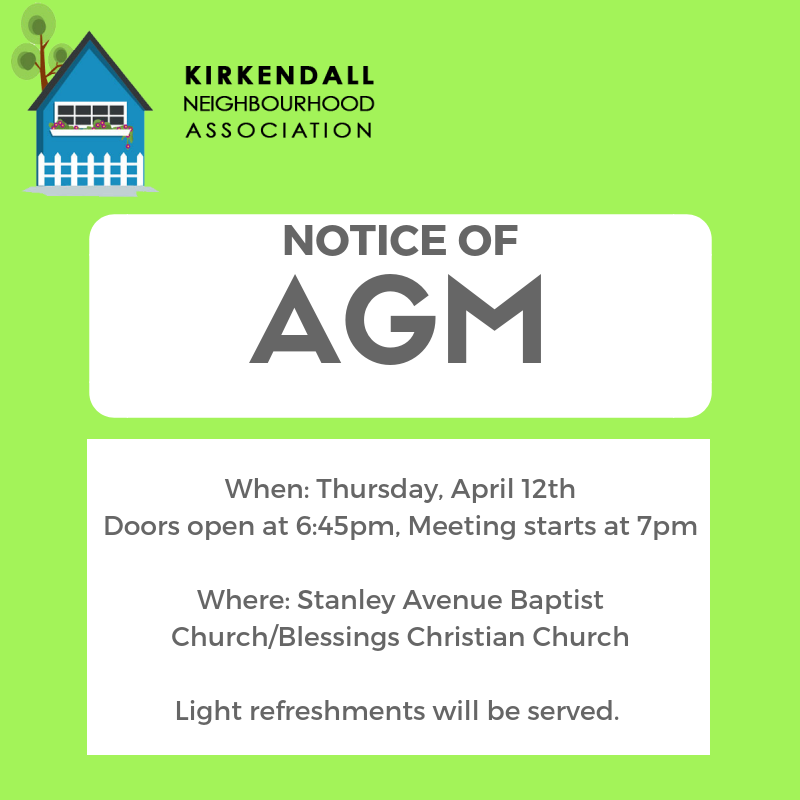 We are now welcoming comments and thoughts about the Operations, Maintenance and Storage Facility (OMSF) as it will have direct impact on the Kirkendall neighbourhood. You can access the full report from the links below. Focus on section 2.7 as it offers an overview. Section 5 starting on Page 17 of the Noise and Vibration study is also important. On page 28 of this report (section 5.1.6) are their recommendations. An addendum to the Environmental Project Report (EPR) for the Hamilton B-Line Light Rail Transit Project, including a summary and all other required documents, has been submitted to the Ministry of Environment and Climate Change an is now available for a 30-day review period from May 29 to June 28, 2017. We received the following letter from our friends at Hamilton Light Rail. We felt it was important to share as it is a time-sensitive matter and an initiative that the KNA fully supports. It all comes down to this coming Wednesday. Hamilton City Council is risking the city’s LRT plan in a high-stakes game and things are getting downright ugly. Council needs to approve an amendment to the Environmental Project Report so that the Environment Ministry can complete its Environmental Assessment for the LRT. 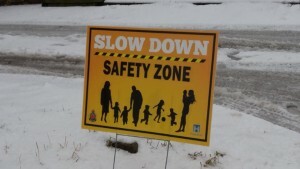 The project can’t move forward until this step is finished, meaning the deadline to get a contract signed to build the system before the next Provincial election will be in jeopardy. Knowing that, a majority of councillors are stalling and filibustering instead of approving the Environmental Report. Councillors have already hashed over the Environmental Report over two long committee meetings totaling literally 26 hours, and at the end of both meetings they voted to defer a decision. This is despite the fact that there is no good reason not to approve the report and submit it to the Province. The vote has been pushed back to the upcoming Council meeting this coming Wednesday, April 26. If Council defers a vote again – or, worse, votes against submitting the report, the entire LRT project will be in jeopardy. We risk losing everything: ten years of planning and development, $1 billion investment in rapid transit, hundreds of millions of dollars in infrastructure replacement and capacity expansion along the LRT corridor, 3,500 construction jobs, apprenticeship programs for young Hamilton, hundreds of millions or even billions of dollars in new transit-oriented development that we need to grow our tax base and get the city’s financial affairs in order, and Hamilton’s very reputation as a serious place to invest and do business. Through a depressing combination of partisanship, gamesmanship, lack of vision, lack of courage and fear of change, there is a very real chance that Council will kill this once-in-a-lifetime chance to transform the future. I’ll be completely honest: if we succeed, this won’t be the last time we have to push Council to do the right thing and stay on track. They will have an opportunity to vote on the Operating and Maintenance Agreement with Metrolinx early next year. This is a long road and we’re not at the finish line yet. But if this step fails, the whole project may well fail with it. So we have to speak up now – respectfully, optimistically, hopefully – and get through this crisis. Then we’ll start planing to be ready for the next one. No huge, city-changing project ever came easy, and this is no different. The important thing is not to become discouraged and give up. There are people around the Council table and in the city who want this project to fail, and our cynicism would be their strongest ally. It’s not too late to save Hamilton’s LRT plan from fear and cynicism, but we all need to push together. 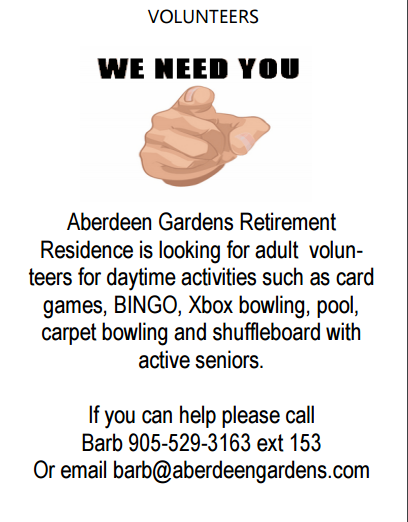 Aberdeen Gardens Retirement Residence is looking for adult volunteers for daytime activities such as card games, BINGO, Xbox bowling, pool, carpet bowling and shuffleboard with active seniors. Drop by Stanley Avenue Baptist Church to pick up your slow down sign during the times listed below. Signs are available on a first come basis.